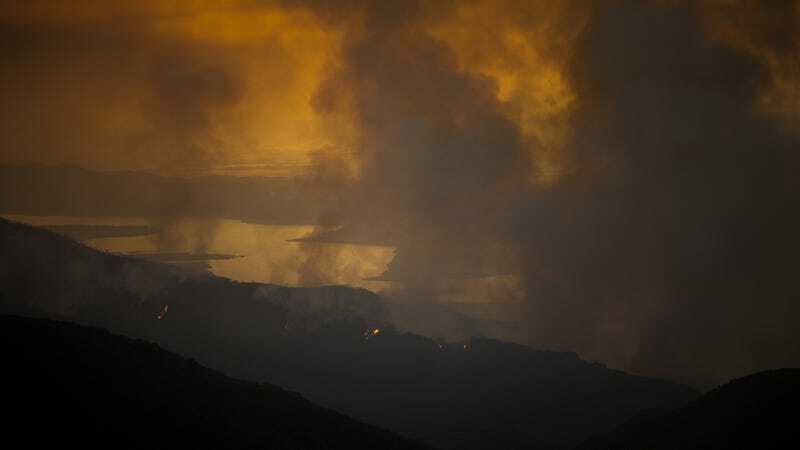 A wildfire burns next to Lake Cachuma on July 9, 2017 near Santa Barbara, California. Image via Getty. In yet another dreary sign of the Florida-fication of the entire country, the Guardian reports that staff at the U.S. Department of Agriculture (USDA) have been instructed not to use the term “climate change” in the course of work. This Orwellian battle against science can’t come as a huge shock considering that Sonny Perdue, Trump’s Secretary of Agriculture, once held a public vigil on government property to pray for rain during a drought as governor of Georgia. Perdue also supported Trump’s exit from the Paris Climate Agreement, stating: “The Earth’s climate has been changing since the planet was formed—on this there is no disagreement. At USDA, we rely on sound science and we remain firmly committed to digging ever deeper into research to develop better methods of agricultural production in that changing climate.” Trump’s nominee for chief USDA scientist, meanwhile, is not a scientist, dismisses climate science, and has referred to progressives as “race traitors.” It’s great to reaffirm that we’re in good hands, eh?